I love this cake. And it is always a big hit when I take it to church dinners. I found this recipe on Pinterest and since I have never actually taken a picture of this cake when I have made it I will direct you back to the pin. Mix the cake mix as directed and bake it. While the cake is baking mix the caramel sauce and milk together until well blended. 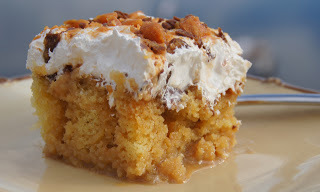 When the cake is done and while it is still warm, poke holes in it with a fork and pour the milk and caramel mixture over it. Now stick it in the refrigerator to let it completely cool and so that the sauces "set". After cake is cooled take it out of the fridge. Crush up that bag of butterfingers. Sprinkle a layer of the butterfingers on the top of the cake. Now put the whip cream on top and make sure you cover the whole top of the cake. Now sprinkle the rest of butterfingers on the top of the whip cream. Serve and wait for the compliments.